For testing any 2, 4, 6 or 8 position modular jack with the Tone Test Set or Craftsperson's Hanset. Includes contacts to connect, via alligator clip leads, to any test apparatus or Lineman's Test Set. 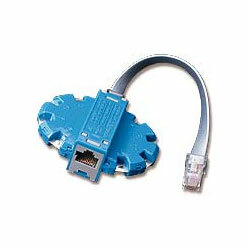 Can be used in series with any cable with a 6- or 8-conductor modular plug.